Almond Beach Resort "Our Belize Vacation" - "Our Belize Vacation"
Almond Beach is an outstanding luxury resort with spa, sharing facilities with our sister resort Jaguar Reef Lodge, on the white sands of the Caribbean. 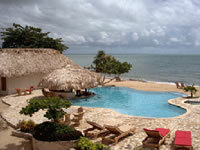 An ideal locale for honeymoons, anniversaries, family vacations, fishing and diving vacations. Almond Beach offers a range of accommodations from Beachfront Casitas to elegant Beachfront Veranda rooms, Honeymoon Casitas and family oriented Two Bedroom Suites. These provide a luxurious place to rest after an active day of diving, snorkeling or exploring the magic of Belize. 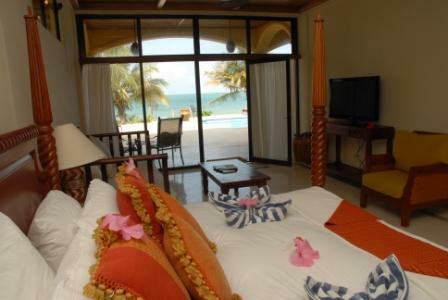 Almond Beach Resort and Spa is located in the Stann Creek District, south of Belize City on the mainland coast of Belize. 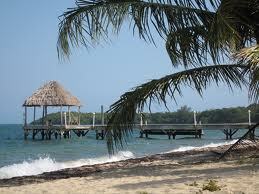 We are close to a number of Belize's national parks, Mayan ruins, and world famous diving and fishing. 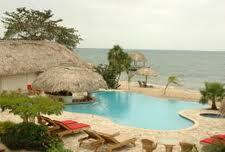 We share services with Jaguar Reef lodge which is right next door to Almond Beach and which we also own and operate. 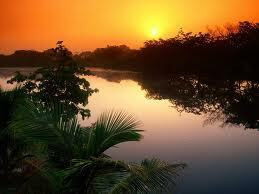 We offer many different tours to explore the eco-wonders of Belize's diverse wildlife and landscape. 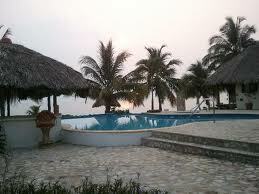 Guests have free access to kayaks and mountain bikes to undertake their own Belize adventures. Directly on the beach and steps away from the Caribbean Sea. Adjacent to the fresh water infinity pool. Thatch Roof, concrete structure, wood porch deck. 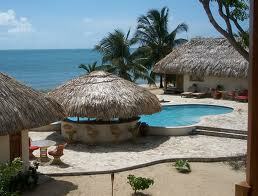 Features Belizean hand-carved furniture and Central American artworks. 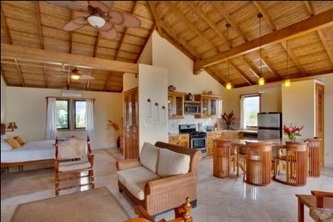 Belizean hardwood floors. Tumbled marble tile floors, double marble sinks, granite counter tops, walk-in shower plus an outdoor shower. King or Queen, plus a loveseat pullout. Raised 12 feet above ground level to catch the sea breeze. 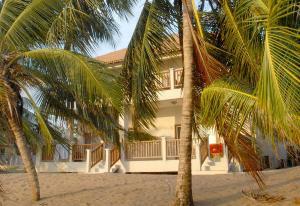 Approximately 75 feet from the white sand of the beach. Belizean hand-carved furniture and Central American artworks. Nicaraguan tile floors, cathedral cane and mahogany ceiling. Double marble sinks, granite counter tops, walk-in shower. King Bed. 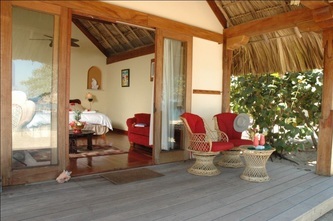 This is mainly designed for honeymooners; however it can also accommodate one child or two children. 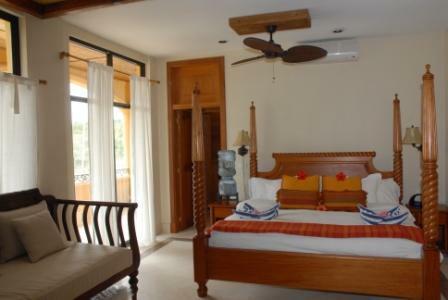 The room is located high above the resort on the top floor of Vista Suite sharing a roof top terrace with a spectacular view towards the Maya Mountains and ocean. Belizean hand-carved furniture and Central American artworks. Polished marble floor inside and tumbled marble floors outside. Marble sink, large marble counter tops, walk-in shower, plus a Jacuzzi tub. King bed and trundle bed. 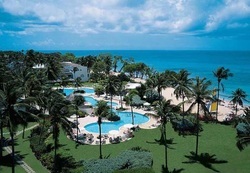 Ideal for a romantic getaway or honeymoon. Is also suitable for families up to four. The view and breeze are special but please remember there are two flights of stairs so it is not recommended for young children or people who have difficulty with stairs. Raised 12 feet above ground level to catch the sea breeze. 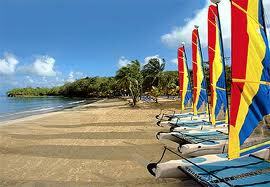 Approximately 75 feet from the white sand of the beach. View: Fresh water infinity pool, beach and the Caribbean Sea Décor: Features Belizean hand-carved furniture and Central American artworks. Nicaraguan tile floors, cathedral cane and mahogany ceiling. Separate 12 foot by 13 foot sitting room/bedroom. Bath: Double marble sinks, granite counter tops, walk-in shower. Bed Type(s) : King Extra Bed (By Request): Twin beds in sitting room Occupancy: The separate sitting area will provide you and friends traveling with you a place to gather before dinner or in the evenings. If you are bringing your children, the sitting room can be furnished with twin beds. 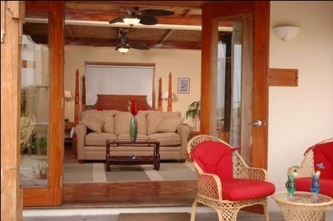 The room is located right in front of the dock approximately 100 feet from the water’s edge. 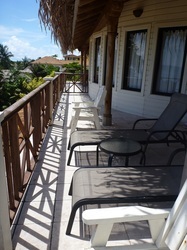 This penthouse room is on the third floor of the Colonial building and providing the highest vantage point in the area. 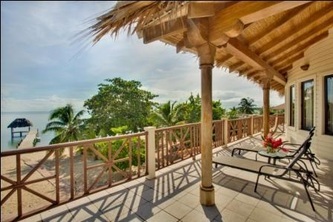 You can see both the cayes off shore and the inland mountains from the east and west facing verandahs. View: From sunrise to sunset, you enjoy a three hundred and sixty degree view. 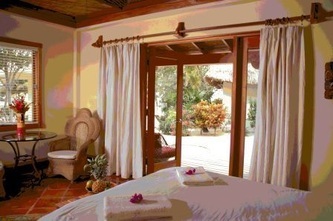 Décor: Features Belizean hand-carved furniture and Central American artworks. Polished marble floor inside and tumbled marble floors outside. A cathedral ceiling is done with large beams, cane and mahogany. Bath: Marble sink, large marble counter tops, walk-in shower, plus a Jacuzzi tub. Bed Type(s): King bed and bunk beds (if required). 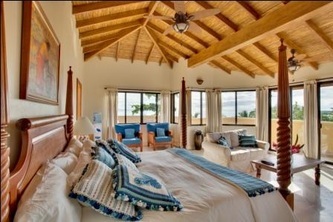 Extra Bed (By Request): Crib Occupancy: Ideal for a romantic getaway or honeymoon. This suite also suitable for families up to four. The view and breeze are special but please remember there are two flights of stairs so it is not recommended for young children or people who have difficulty with stairs. 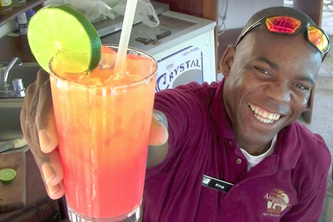 The room is located right in front of the dock approximately 100 feet from the water’s edge. 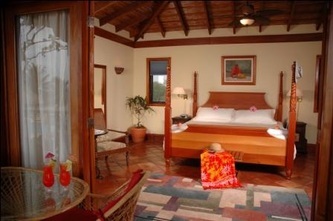 This roof top room is on the third floor of the Colonial building with beautiful views. You can see both the cayes off shore and the inland mountains from the east and west facing verandahs. View: From sunrise to sunset, you enjoy a three hundred and sixty degree view. 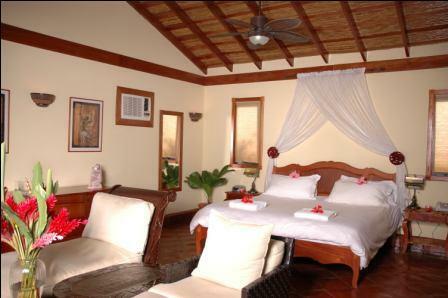 Décor: Features Belizean hand-carved furniture and Central American artworks. Polished marble floor inside and tumbled marble floors outside. A cathedral ceiling is done with large beams, cane and mahogany. Bath: Marble sink, large marble counter tops, walk-in shower, plus a Jacuzzi tub. Bed Type(s): King bed and bunk bed. 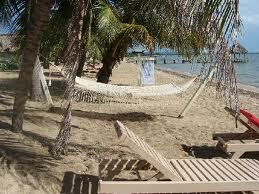 Extra Bed (By Request): Crib Occupancy: Ideal for a romantic getaway or honeymoon. Is also suitable for families up to four. The view and breeze are special but please remember there are two flights of stairs so it is not recommended for young children or people who have difficulty with stairs. Extra Bed (By Request): Single bed or crib Occupancy: Ideal for a couple or a couple with 2 children. Maximum capacity four. 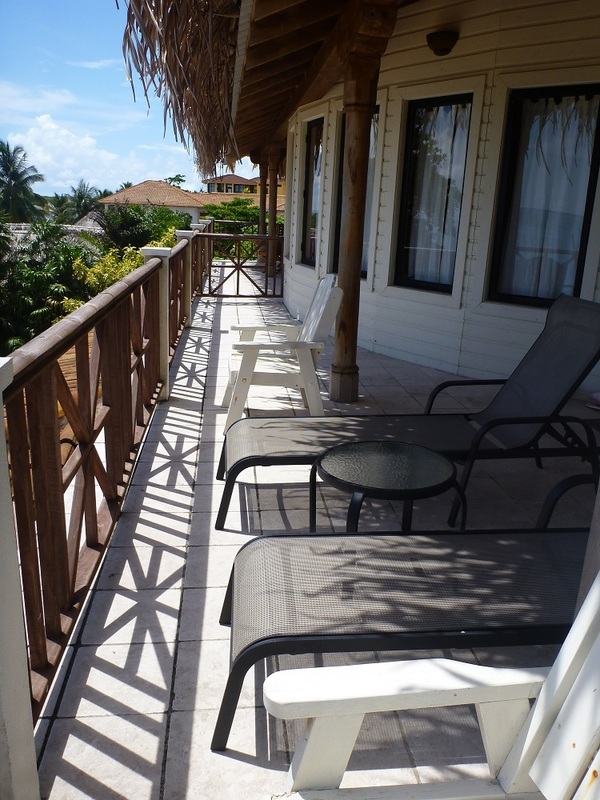 Ground level of the Vista Suite building looking out to the beach and pool approximately 60 feet from the Sea.. View: The pool, sand beach and the Caribbean Sea Décor: Features Belizean hand-carved furniture and Central American artworks. Tumbled marble floors, cane and mahogany ceiling. Bath: Shower, marble sink and counter top, Mexican hand-painted sink. Separate toilet Bed Type(s) : King and trundle bed. 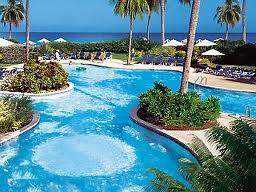 At pool level and approximately 75 feet from the white sand beach. View: Fresh water infinity pool, beach and the Caribbean Sea Décor: Features Belizean hand-carved furniture and Central American artworks. 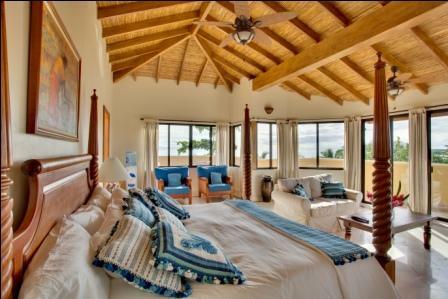 Nicaraguan tile floors, cane and mahogany ceiling. Bath: Shower, marble sink, granite counter top. Bed Type(s) : King Extra Bed (By Request): Single bed or crib Occupancy: Ideal for a couple who want comfortable accommodation at an affordable price. 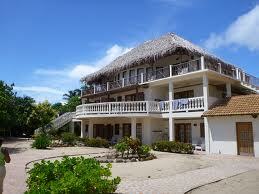 In a three story building approximately 75 feet from the white sand beach. View: Fresh water infinity pool, beach and the Caribbean Sea Décor: Features Belizean hand-carved furniture and Central American artworks. Nicaraguan tile floors, cane and mahogany ceiling. Bath: Shower, marble sink, granite counter top.